Pierce Brosnan and Greg Kinnear. The Matador isn’t overly exciting, but it’s got enough style and originality to make it an enjoyable and worthwhile film. Englishman Pierce Brosnan stars as Julian Noble, a lone hitman experiencing a mid-life crisis and in desperate need of a friend. At a bar in Mexico City, he encounters businessman Danny Wright (Greg Kinnear), whose in town on a business venture. The two spark a conversation and eventually, a friendship is formed. The next day, Julian invites Danny Wright to go and see a bullfight with him. At the bullfight, Julian unveils to Danny his true line of work, to which Danny is skeptical at first. But Julian quickly proves that he isn’t lying by taking Danny through the steps of murdering someone, using a portly patron as an example. A short time later, Julian asks for Danny’s assistance in helping him “facilitate a fatality”, which essentially means “execute” someone. Danny is very much against the idea and two split up. Later that night, Julian shows up at Danny’s hotel room, apologizing. The screen fades to black and we pick up six months later. Now, if you don’t think that’s an adequate plot summary, don’t worry: neither do I. The Matador doesn’t have a proper storyline like most films. That’s one of the reasons why it’s so original. Possibly the most attractive feature here is the lead performance from Pierce Brosnan, who generates such a likable character that it’s next to impossible to find the film boring, even if you don’t like anything else. 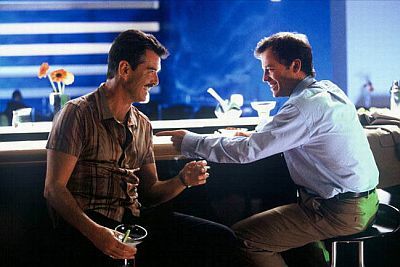 Brosnan is just so exuberant and funny and charismatic. His Golden Globe nomination was well-deserved. The Matador gets even better the second time around. It’s so simple and low-key but so well-made. It’s got a good head on its shoulders (director Richard Shepard) and becomes so increasingly inventive that I remained entertained for the time being. That’s more than what I can say about most summer blockbusters. And it’s funny. Darkly funny, at that. It’s a great little buddy film and has that kind of style I wish more films nowadays had. MPAA Classification: PG-13 for thematic material, violence, terror and frightening images, and brief strong language. It’s nice to see up-and-coming filmmakers pay homage to classic horror films like Poltergeist andThe Shining. While Insidious is scary from time to time, it is never terrifying, but there is a childish heart at the center of it. The director, James Wan, never flat-out steals any of his tricks from those films, but instead comes up with his own and, because of this, Insidious makes for an interesting ride. It begins on a family as they are just relocating to a new home. The parents, Renai and John (Rose Byrne and Patrick Wilson), are young, still a bit naive, and have three children. Like any good horror film, there are a good deal of spooky and unexplained moments at the beginning, such as boxes that keep taking themselves off of the shelf and noises in the attic. One of the sons, Dalton (Ty Simpkins), decides to investigate, but hurts himself when he falls off of a ladder. The next day, he’s in a coma and is taken to the hospital. Eventually, things begin to get so out of hand in the house that the family assumes it is haunted. They move, but after a short time, things start happening there as well, including a short demonic boy that dances around to Tiny Tim’s “Tiptoe Through the Tulips.” A woman who deals with paranormal activities name Elise (Lin Shaye) is invited over to their house, and she learns that Dalton has a strange, strange ability.Then a period of time passes. Three months, actually. Dalton, still in a coma, is moved from the hospital back to the house. This is where Insidious starts to get a little creepier. The wife, Renai, begins to actually see hear and see people in her house, walking around. One of the scariest scenes involves a voice yelling over a baby monitor. Of course, when Renai tries to tell Josh about what’s going on in the house, he doesn’t believe her. Let me start off by saying that Insidious is one of the creepiest films that I’ve seen in a long time, and that’s saying something in this day and age. At the beginning, Wan keeps most of the eerie elements off-screen. He fools us into thinking that it will remain that way until the end, but it doesn’t. Slowly, the demons and ghouls are brought onto the screen, into our line of vision, which is something that we didn’t expect. Granted, the overall effect isn’t as creepy, but it’s weird to have the strange noises actually belong to something. The biggest problem that Insidious has it that it goes from being decidedly creepy to being too over-the-top, and it loses a lot of the fear factor that is so steadily maintained. The tone changes a short time after the family moves into the second house, where Insidious becomes less of a horror film and more a generic thriller. There is a scene where the father, Josh, ventures into a dark world to rescue his son and must engage it what looks like a boss battle from a video game. The ending is a chaotic mess of so-so special effects and heavy editing. And I’m not exactly calling it bad. The ending is not particularly good, but it is not an utterly pathetic attempt to close an otherwise good film. Wan had something going in the first half, where he grabbed our attention, but he loses it all by the end. The second half is not terrible, but it’s lousy when compared to the first. James Wan shows some promise here as a director of thrillers, as he also did in the Kevin Bacon vehicle, Death Sentence.He has a very unique vision, which is something that most directors lack, and he certainly incorporates a lot of unprecedented style into most of his work. For Insidious, all that he needed was a better way to wrap it up and he would’ve had a good film on his hands. It’s almost sad to watch everything go so steadily downhill. But for the most part, you’ll get a kick out of Insidious. It’s a breath of fresh air into a room of stale horror films that makes for a spooky haunted house ride.